Welcome to the month long blogging event happening here. We, a group of bloggers, call ourselves BMers, and blog every month under different themes. April and September happen to be special months with 26 days of blogging. Today's Tomato Upma also known as Tomato Bath, is popular in the South. So it can be pinned for any of the states. It is a go-to recipe at home for the morning rush hour or even for a hurried dinner. It is one of my favorites with simple flavors and no frills. There are many versions of this upma using onion as well. But I refrain from using it and so is perfect for festival days as well. In my growing up years my favorite accompaniment was sugar but now I add enough green chilies that I don't need any accompaniment. The consistency of this upma is an individual choice. We like it soft but there are others who like it powdery and still others who like it in a porridge consistency. Blanch the tomato, peel the skin and chop into small cubes. In a heated pan, add oil and rest of the ingredients. After the peanuts are roasted and the mustard seeds crackle, add the semolina. Fry for a couple of minutes. Add in salt and green chili paste. Add 2 cups of water, mix well, reduce heat, cover with a lid and let the semolina cook well. After 5-6 minutes, remove the lid, mix well and remove from heat. Most hated breakfast is always Upma, but its my all time favourite. Would love to eat even without a side dish. And this tomato upma sounds prefect for me to have anytime of the day. First of all, I am in love with your plate!Growing up, Kichidi and upma were my least favorite breakfasts.But now got to make it sometimes as the family likes it! I will try this variation the next time anyone at home craves for upma. Fantastic choice Harini, love breakfast dishes..and this is a classic one...Can't wait to see what your other themes are! 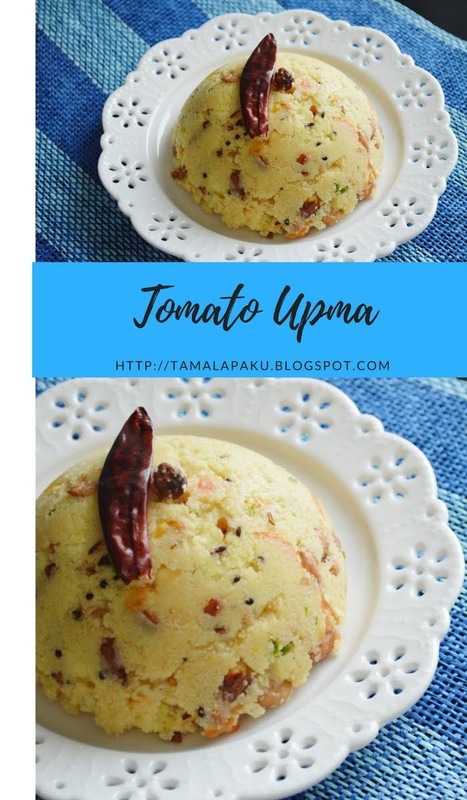 I have never added tomatoes in upma but then I guess I never knew about this tomato upma. Love this simple and filling breakfast to the core. Looking forward to seeing your recipes Harini. Lovely start harini!! Upma though frowned upon many, there are quite a few like me who love it anyday!!! It needs a great skill to get that likeable consistency!! yours look perfect!! My go-to recipe on Thursday and amavasai days. Love these simple no onion no garlic tiffin recipes. Harini, that is a great choice for breakfast and really handy in days when we don't eat onions. My mother always makes it with tomato and I live the slight acidic flavor the upma has. Yours has come out perfectly. Looking forward to the rest of your posts. Looking forward to your delicious creations this month. I am very fond of this breakfast from South . There are times when I have it for dinner , in fact I had onion upma last night , I am bookmarking the tomato version , rather keeping in my mind to make it soon again . Looking forward to the other breakfast dishes ! Your upma sounds fabulous with the hint of tanginess coming from tomato. A greatdish to start the marathon and looking forward to see your recipes this month. I love the simplest form of upma without onions. The crunch from the dhals is enough to make it really tasty. I haven't tried this tomato version, but it sounds so good. Perfect dish for an amazing breakfast. I love that mind red colour and the tangy flavour in tomato upma.. Perfect with some Coconut chutney.. Yummy.. Anyhow, I'm definitely happy I found it and I'll be book-marking it and checking back frequently! i love upmas of all kinds.. and this is a great start to the BM ! I too used to eat upma with sugar growin up ! perhaps al that upma and sugar stayed back on the waistline :-) lol !! Healthy choice for breakfast... everyone really love it. Super delicious upma. I usually make with mixed veggies but haven't tried it by adding tomato. Must try it.